"Charming Romantic Comedy Marred by Gratuitous Objectionable Content"
JULIET, NAKED tells the charming story of a woman who falls for her former longtime boyfriend’s rock idol, but things get complicated when they try to turn their transatlantic email exchange into something more. Mostly grounded in reality, the movie manages to be charming without cheesy, and heartfelt while still feeling honest. Sadly, JULIET, NAKED is spoiled by some gratuitous foul language, lewd content and homosexual references that seem out of place with the rest of the movie. JULIET, NAKED is a charming yet understated romantic comedy with a lot of heart, even if the plot feels uneven. Mostly grounded in reality, the movie manages to be charming without being cheesy, and heartfelt while still feeling honest. With so much warmth to it, including wonderful performances by the leading cast, it seems odd that the movie went with an R-rating since most of the foul language and sexual references seem out of place in what would otherwise be a delightful, albeit predictable, movie. 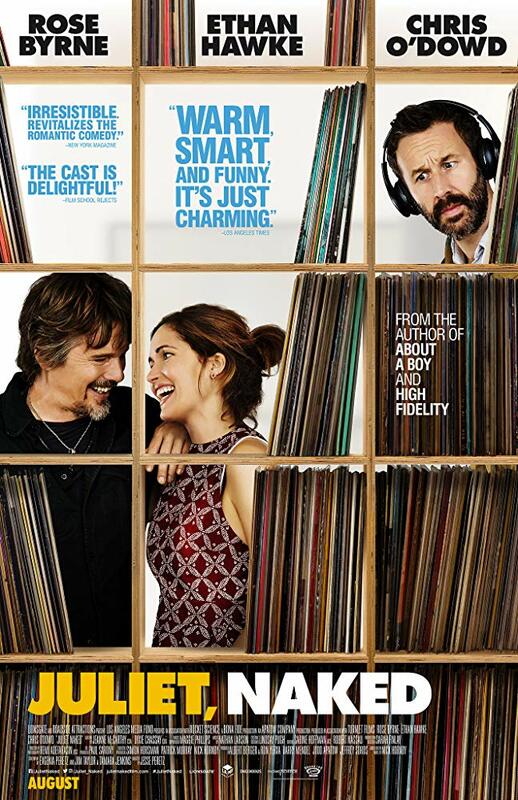 Annie (Rose Byrne) feels stuck in her boring life as a museum curator in a 15-year relationship with Duncan (Chris O’Dowd), a college professor and number-one fan of 1990s rock musician Tucker Crowe (Ethan Hawke). When it becomes clear to Annie she’ll always take second place to Tucker Crowe in Duncan’s mind, she takes matters into her own hands on a Tucker Crowe fansite, leaving a mean review of his newest album, which leads to an email exchange with Tucker himself. As Annie and Tucker begin their transatlantic email correspondence, it becomes clear he understands her far better than Duncan ever has. As their relationship evolves, the two have to figure out if there’s more than just simple email correspondence and if Duncan can accept his former girlfriend dating his idol. Brimming with charm and heart, JULIET, NAKED brings consistent smiles throughout its running time. Rose Byrne shines in her role as Annie, as she often does. Chis O’Dowd gives a great performance as a pretentious cinephile and culture snob. He is always fun to watch, but his character is rather one-dimensional. He’s annoying at best and adulterous at worst, leading the viewer to question Annie’s intelligence as to why she stayed with him so long. Ultimately, Duncan isn’t really a source of conflict between Annie and Tucker as JULIET, NAKED falls to the unfortunate romcom trope of the “evil boyfriend” vs. the “great new guy.” No one in their right mind would choose Duncan over Tucker, so the plot becomes easy and predictable. Yet the movie has enough going for it to still be interesting. As a washed-up rocker, Ethan Hawke gives a great performance as Tucker struggles with the mistakes of his past, including the four children he had with the various women he met on the road. It’s refreshing to see a man who’s learned from his mistakes and dedicates the rest of his life to being a good father. Within this struggle, JULIET, NAKED steps out of the norm of romantic comedies and becomes a movie about redemption and second chances. While the performances, plot and characters sustain the enjoyment throughout the movie, there are some moral flaws in the content. Annie makes a joke that she is against organized religion as an excuse for her 15-year relationship to Duncan without marriage. Since neither are truly committed to the other, they ultimately separate due to infidelity and boredom. The movie praises Annie for choosing what makes her happy in the end. While this is a valiant character arc, it sends the message that personal happiness is what is most important in a romantic relationship. The movie also garners an R-rating, mostly for some foul language and sexual references, which seem out of place in this understated and charming, though predictable, movie. JULIET, NAKED is an understated romantic comedy. After 15 years with Duncan, Annie couldn’t feel more stuck or unhappy. Every day she watches Duncan run an ultimate fan website for Tucker Crowe, a once-famous rocker who’s fallen into obscurity. However, when Annie meets Tucker Crowe through a chance encounter, the two discover they may be perfect for each other. When Tucker comes to visit, Annie must decide if she can go after the life she always wanted and if Duncan can accept his former girlfriend dating his idol. The movie’s title comes from the title of Tucker’s new album. With great performances and grounded charm, JULIET, NAKED is mostly a delight, if viewers can forgive a few clichés and the predictable plot. While there are great themes of parenthood and second chances, the R rating seems out of place. The movie could have done without its foul language and sexual references. The movie’s main love story is cute but ultimately falls to the idea that personal happiness is what matters most in a romantic relationship. Extreme caution is advised for JULIET, NAKED.